Three world filmmakers team up for this anthology exploring the ways in which people connect sexually. The strongest segment is Wong Kar-wai's "The Hand," starring Gong Li as an elegant courtesan who engages a tailor (Chang Chen) and, with a single stroke of her hand, keeps him at her service for years. Wong takes his fetish for form-fitting dresses to new heights, delighting in the delicate sighs of human hands on silky cloth. Steven Soderbergh's odd, funny segment, "Equilibrium," takes great joy in the bantering performances by Robert Downey Jr. as a seller of alarm clocks and Alan Arkin as a shrink. 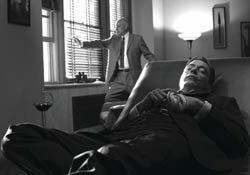 Soderbergh shoots in beautiful, moody black-and-white and teases with a couple of tingly sidebar mysteries, but eventually gets too crafty and loses his way. Finally grandmaster Michelangelo Antonioni returns to the cinema with "The Dangerous Thread of Things," an overly artsy and confusing metaphor, not helped by its odd and clumsy Italian dubbed soundtrack. In it, a man (Christopher Buchholz) fights with his wife (Regina Nemni) and then sleeps with another woman (Luisa Ranieri). Some scenes feel like dreams and others do not. This makes it difficult to grasp any passage of time, rendering the characters mere ciphers. Nevertheless, taken one at a time, many of the film's images are fascinating and strikingly beautiful; not many living filmmakers could match them. After all, it was Antonioni who inspired Wong and Soderbergh to make this film in the first place.